Most of the time, I like to blog about a sewing project soon after completion, whilst the experience of making it is still fresh in my mind. These Lander shorts, however, were tricky to get round to photographing because I've been wearing them so much, they always seem to be in the wash. I eventually got these pics taken a couple of days ago, and if you were wondering what Lander shorts look like when they've been worn almost constantly for two months, then I have your answer right here. It's not often that I fall in love with a sewing pattern the very first instant that I become aware of it. Usually, it takes seeing a number of versions pop up via blogs and Instagram before a pattern can fully win me over. However, this one I knew straight away that I had to have it. I included it in my #2018makenine plans at the very beginning of the year, but I didn't pull the trigger and buy it until May, when I was able to take advantage of the #MMMay18 celebration discount codes (I also bought the zipper expansion pack, FYI). I'm deeply obsessed with the full length (view C, pictured above) version of this pattern. But with summer then just round the corner, like many other sewers, I decided to make a hopefully-wearable toile of the shorts version as my entry point. I'd read good things about how this pattern has been drafted, and that many had found that minimal fitting was required. In general, I completely agree, however I did take things slowly and made a number of alterations that I'll share with you now, if you're interested. First up, I started by blending between the sizes for my waist and hips, as I so often do. I chose the size 8 for the hips, blending out to a size 10 at the waist. The pattern gives you a sizeable 1" seam allowance on the side seams so you can make any tweaks that you find necessary. At the point of fitting the side seams, the pattern instructions do say that you can't alter the waist measurement during your tweaking, because your waistband will no longer fit if you do. I didn't even look at the waistband pattern piece, much less cut it out, until I had the shorts almost completed with the side seams basted, partly because I wanted the option to alter the side seams at the waist if I needed to. I ended up letting my side seams out a straight 1/2" all the way down (effectively giving me an extra 2" all the way around my bootay). I then pinched out about 2cm total per dart at the back to get the waistline to lie nicely against my body (I'm beginning to suspect I have a sway back situation going on). I restitched my darts so that they were curved rather than straight and made this alteration on my pattern pieces for next time. The other reason why I didn't cut out my waistband out until I absolutely needed to, was because I had read that a number of people had drafted curved waistbands rather then use the straight waistband included in the pattern. I wasn't sure if that need would apply to me, but after the dart pinching, I was convinced I would also have to redraft the waistband to include a curve if I didn't want it to sit up weirdly at the back. I then hit a bit of a stumbling block; I wasn't sure exactly how much to curve it or on at what point of the waistband to do so. By chance, I saw on Instagram that Josie of Fabric Godmother was tackling the Lander pants pattern at the same time as me. We entered into a discussion and she said that she planned to add the curve just at the back, between one side seam and the other. This made total sense to me; I don't go 'in' around the belly area, so curving the waistband at the front didn't feel necessary. So when I finally did draft my waistband, I started by tracing off the original size 10 waistband, minus the seam allowance. Then added the extra at the side seams that I had needed, then I removed the measurement that I had had to pinch out of the back darts, and THEN I added a curve to the back area (between the side seams). I created the curve by slashing down through the waistband and overlapping the slashes at regular intervals, eyeballing the curve that I was forming. I then added the seam allowance to all the edges. It may be worth mentioning that a curved waistband has to be cut in two mirror-image pieces (a waistband and a waistband facing, if you like), rather than in one piece like the original waistband pattern piece. The other, more minor changes I made to the pattern were: 1) to shorten the length of the hem a little, 2) make the curved topstitching at the fly at little farther out to accommodate my buttonholes (my buttons are slightly larger than the pattern recommends, and 3) to leave off the belt loops as I know I'll never wear these with a belt. I'm guessing this fabric is a cotton or poly/cotton twill, and its origin and how it got into to my stash are even more of a mystery. What I do know is that this fabric was in two pieces, and has lived in my stash for at least five years. Recently, I had made some vague plans to use it to make some trousers for Frankie, possibly involving some red piping. However, I wasn't sold on that plan as I'm not a fan of kids wearing trousers from fabric that have no stretch to it, so it wasn't much of a struggle to bury that idea and use it for these shorts instead. There was just enough for these shorts if I cut the waistband facing from something else, so in the end I felt that this twill was destined to become these shorts! I'm a fan of a contrast waistband, so I used a scrap of the koi print cotton left over from the matching shirts I recently made. I used a scrap of black and white gingham to line the pockets, and despite deploying the techniques in the instructions to cut back the pocket lining pieces to avoid them being visible, you can still see peeks of it from the outside around the edges of the pocket if you look closely enough. Next time I'll try to select a pocket lining very similar to my outer fabric. I chose these metal buttons from my stash because, A) they were in my stash and therefore effectively free, and B), because I thought that, when combined with this khaki twill, it gave a cute nod to a uniform-y vibe, like the original boy scout shorts that I heard in a podcast inspired Kelli from True Bias to design this pattern in the first place. I'm so glad that I took the time to complete all those tweaks and changes carefully, because I think the fit is pretty spot on. They are really comfortable to wear, despite being made from a non-stretch woven fabric, although I might take a tiny scoop out of the front crotch curve on my next pair. Although the waistband curve was eyeballed, I'm very happy with how it fits snuggly around my lower back, and unless a different fabric type or weight loss/gain force me to take the side seams in or out, I'll use the same waistband piece going forwards. Although I'm now itching to make a squillion pairs of the full-length Lander pants, I can definitely see another pair or two of Lander shorts getting made for next summer. I've got my eye on a couple of pieces of fabric already in my stash for them, and I'll probably change the fit of the leg slightly to make them closer fitting, hopefully more akin to the image of the Lander shorts on the True Bias website. These shorts have also made me entirely reconsider my stance on khaki. I would NEVER have picked this fabric out if I were shopping in a fabric shop, however I have been really surprised by how much of my existing wardrobe this colour goes with. On the back of this discovery, I even got some khaki linen/cotton from the most recent Fabric Godmother open day for another project I've got lined up for the near future. Not only am I excited to make the full length Landers next, but I'm also chomping at the bit to try drafting different pocket shapes and styles, have a go at the zip fly, and maybe to play with constrasting topstitching threads. Expect to see more Landers round here before the year is out. I absolutely love thoes! Great Job! I wasn't attracted to this pattern before. You have completely changed my mind; they look fantastic! And after a couple of months wear too. I can't wait to see your trousers. These look fab on you, superb fit. Thanks for all the helpful details. Those look great! Thanks so much for the tips, especially the curved waistband and the pocket lining being sometimes visible. 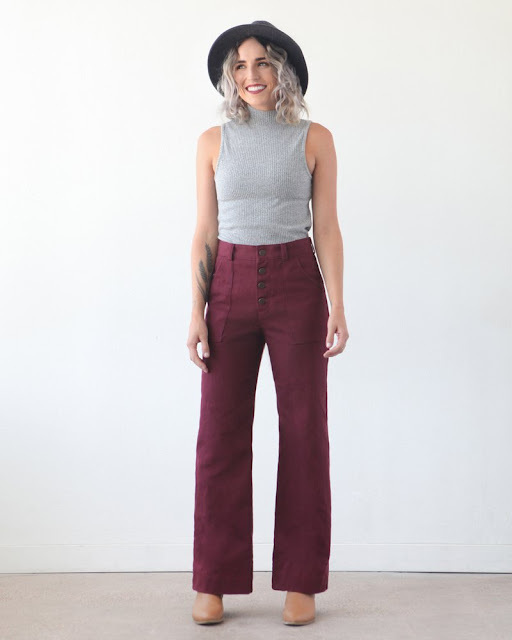 Hoping to make a pair of Lander pants later this year--I'll be following your suggestions when I do! They look great on you!! Fabulous job! Helpful post and great job, thanks for share. The shorts look great! Thanks for the detailed description of the alterations to the waistband and the tip about not even cutting your waistband piece until you are ready to baste-fit - what a genius idea (that never would have occurred to me because that would mean not following the instructions like a "good" sewing student)! They look a really good fit I can see why you have been wearing them so much. The details look very professional. Wow, these look absolutely fab. You've got a perfect fit there. Thanks for taking the time to tell us all your alterations. The waistband information is pure gold. Like most folk I struggle with getting the fit right on trousers but I think I'm going to have to give the Landers a go. Brilliant! Thanks for posting so many details, it is so helpful. I love them on you.